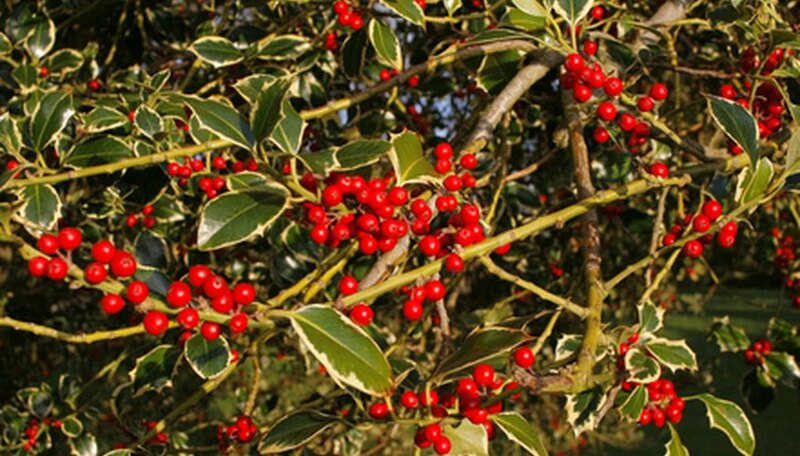 When you think of evergreen trees with bright red berries, you may think of holly trees. Holly trees are grown in a variety of species and range from small dwarf hollies to towering giants like the Nellie R. Stevens holly, towering over 40 feet. Hardy holly trees are typically fringed with small spines. Evergreen hollies maintain their vibrant color all year long. Carolina sentinel holly is an evergreen tree with moderate growth range and upright, dense form. Beginning in the spring, small, white flowers emerge to contrast with the dark green foliage. These striking trees also create a hardy crop of red berries every fall, which last into winter. The leaves on the Carolina sentinel are green, alternating and compact. The Carolina sentinel grows between 20 and 25 feet tall and prefers full sun to partial shade and moist, well-drained soil. These tall evergreens make excellent hedgerows and privacy screens among the landscape. The USDA hardiness zone is 5 to 9. This evergreen tree has red, orange or yellow berries that emerge every winter. The dense, pyramidal shape of English holly grows up to 50 feet high and 15 feet wide, making for a commanding landscape tree. English holly trees have medium texture and prefer sun to partial shade to thrive. The dark green, glossy leaves are fringed with a creamy yellow color, as well as prickly spines. English holly leaves grow between 1 and 3 inches long. These long-lasting trees require well-drained, adequate drainage, but dislike high humidity and temperatures. The USDA hardiness zone is 6 to 8. The yaupon holly is an evergreen tree with a moderate-to-rapid growth rate. The dark green leaves are lustrous and grow more than 1 inch long. Yaupon holly trees produce small, white flowers every spring to light up the landscape. Beginning in the fall, small, shiny red berries emerge and last into the winter. The upright, irregular from of the yaupon holly grows up to 20 feet tall and wide. They require full sun to partial shade and can tolerate a wide range of soil types, including moist and dry soils. Yaupon holly trees are also drought and salt tolerant and attract birds and butterflies. The USDA hardiness zone is 7 to 9.